Lunchbox Dad: Save The Bacon, Grow A Mo'! If you're wondering what this has to do with food, there's bacon in the picture. Bacon is good. But I'm asking you to think about something better. If you read my post about my new Gillette razor you know I am growing a mustache for Movember. It looks horrible but the reason I'm doing it is to fight something worse--cancer. This is what Movember is all about. My goal for terrorizing my wife with this mustache is threefold. The first two are to raise awareness and raise donations to help fight cancer in men. Many of you know how horrible it is to know someone who has been sick with cancer, or you might have had to deal with it yourself. This is my third reason for doing this. I want to honor my dad who died from cancer last year. For these three reasons I am asking you to consider donating to the Movember Foundation. It is tax deductible and with every donation of $15 or more I am giving you a free copy of my ebook, Adventures In Lunchboxing if you donate through the link below. 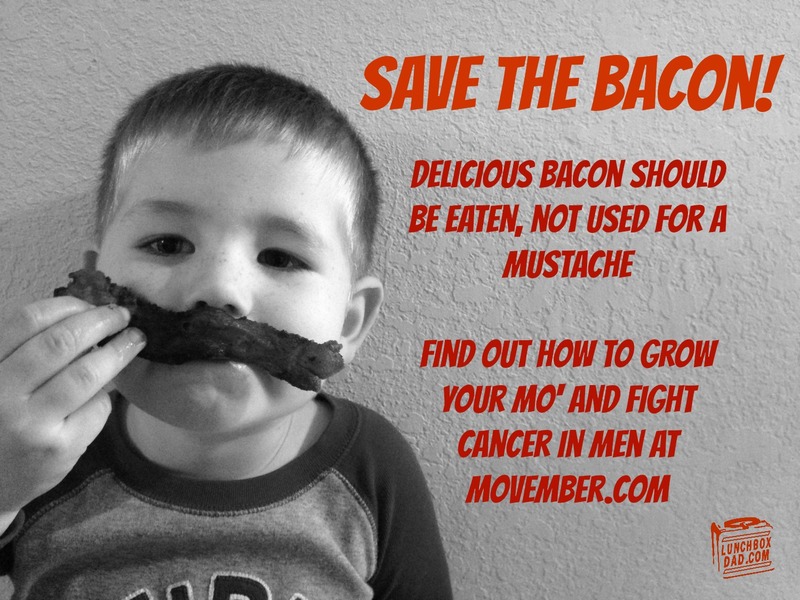 Thank you for considering being part of the fight and save the bacon!